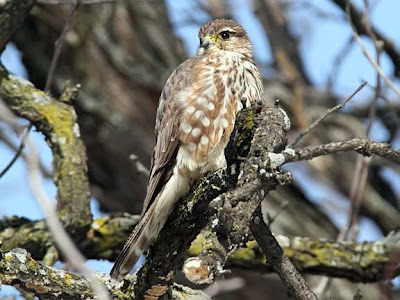 When most people think of the word merlin they picture an old man with a long gray beard doing magic back in the middle ages, but if you are lucky you might be able to see a merlin outside your window today. The merlin is a small falcon that can be found through out parts of the northern hemisphere. They are circumpolar, with nine different subspecies found around the world, 3 in North America and 6 in Eurasia. Over the ages the merlin has been called several different names. In medieval times they were referred to as the queens falcon or lady's falcon. During this time period falconry, hunting using a hawk or falcon, was all the rage with the nobility. While the royal men would use the larger falcons royal women would typically hunt with the smaller merlin falcon. Later on merlins were referred to as pigeon hawks, even though they are considerably smaller then a pigeon and it would be rare to see a merlin trying to take prey that large. Very interesting! I'd never heard of this bird before. Excellent photos of a great old wise bird. Beautiful majestic bird. I can see why Queens chose them. Neat photos of the merlin! Interesting info. and the pictures are lovely. I always love coming here to see your bird shots. This is a lovely little falcon. I don't think of an old man with a beard, I think of my deck covered in the heads, wings and feet of songbirds after a pair of Merlins and their youngster used our big trees as their dining table. It was years ago, but I've never recovered from the shock. They're still in the neighborhood, because I hear them when they're around, but they're staying out of our trees now. Whew. Beautiful photos. 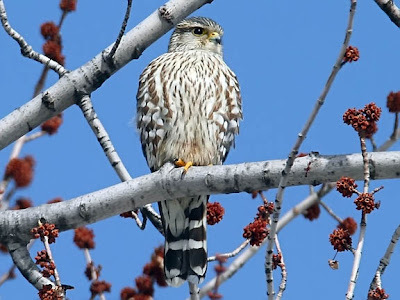 My brother has seen Merlins in Newfoundland, I haven't yet spotted any in my bird watching here in southwestern Ontario. Drat! I saw one of these today, on Gabriola Island, in British Columbia. Beautiful animal and the photo you've posted confirms my ID. Cheers.